These felt rug pads do not contain rubber, they are not meant to prevent rug slipping. Rug Pad Central 100% recycled felt rug pads are an excellent addition to any area rug and floor. Add extra comfort, protection and cushion with this thick felt rug pad made in a full 1/3" pile. Our 100% felt rug pad is extremely dense to prevent pressure penetration to the floor - making it ideal to prevent wear and damage to your area rugs and floors. Felt will not mark, stain, stick to or damage hardwood or any hard surface. Rug Pad Central felt is excellent for noise reduction, as it absorbs the pressure that causes floor noise. These are hypoallergenic, mold and mildew resistant and LEED certified for cleaner air quality. Always follow all flooring manufacturers guidelines for flooring care and maintenance. 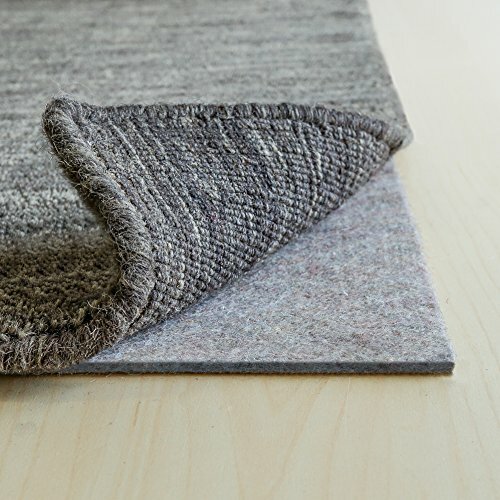 Made in USA by Rug Pad Central - 100% recycled felt in a full 1/3" thickness; Prolongs the life of your rug and floor - Extremely dense; Hypoallergenic; Mold/mildew resistant; LEED certified for air quality; Excellent noise reduction rug pads for use in apartments, co-ops, etc. Dense supportive felt layer is non-abraisive and will not scratch your floor. Needle punched felt is breatheable and also safe to use with radiant heated flooring. Does not have a rubber backing and will not prevent slipping, so not ideal for smaller rugs. If you have any questions about this product by RUGPADUSA, contact us by completing and submitting the form below. If you are looking for a specif part number, please include it with your message. nuLOOM Cream Luxuries Posh Shag Rug, 5' 3" x 7' 6"